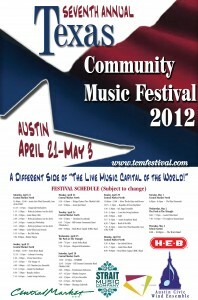 Download Your TCMF Poster Today! Now that we’ve got a final lineup, we’ve got a final poster! Download this and other TCMF promotional materials from the press room and distribute to all your band members, followers, friends and total strangers! Go to the press room for a complete array of TCMF materials, and don’t forget to visit our CafePress site for all your TCMF commemorative items, like T-Shirts, Coffee Mugs and more. We’re counting down to downbeat, music lovers. Get ready, because this is going to be the greatest TCMF in history!